How much does it cost to travel to Dingle? How much money will you need in Dingle? €96 ($108) is the average daily price for traveling in Dingle. The average price of food for one day is €32 ($36). The average price of a hotel for a couple is €109 ($123). Additional pricing is in the table below. These average travel prices have been collected from other travelers to help you plan your own travel budget. 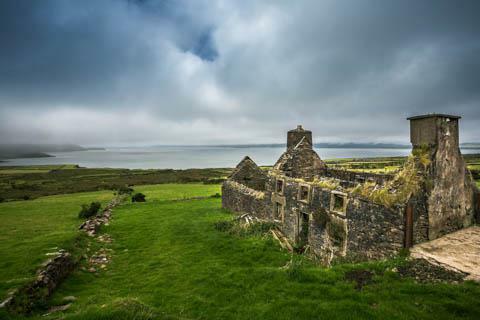 In County Kerry, in southwest Ireland, the Dingle Peninsula is the smaller of the two peninsulas. It has beautiful and wild landscape. The eastern side of the peninsula is steep and dramatic while the western side has a dramatic coastline with cliffs and beaches. Dingle town, also known as An Daingean, is a small town that you can walk around. It also has many restaurants and shops that line the streets. The town is located between the mountains and the sea and it is a great place to relax. There are plenty of bed and breakfasts, hostels, and restaurants so this is a great place to base yourself during your time in the area. Like most of Ireland, the Dingle Peninsula is prone to rain. Because it sits on the Atlantic Ocean, it is influenced by the Gulf Stream, so the region is warmer than you might expect year around. Still, it never gets too hot and summer daytime temperatures rarely get uncomfortable. Winter temperatures are usually above freezing as well. The rain feels almost constant during the winter months, but during the summer you may see the sun occasionally. There are several popular routes around the peninsula that have a lot to offer visitors. Conor Pass is a scenic route along a mountain road. It has great views on clear days and it passes by many sheep and goats alongside the road. There's also a small waterfall along the route that can be seen from the road. There's a short hike by the waterfall as well. Slea Head Drive is a nice loop that is about 30 kilometers long. You can do it with either a car or a bicycle. The road passes by many bays, beaches and rocky cliffs. There are hiking trails and golf courses along the way as well. You should stop by and say hi to Fungi the Dolphin, who lives in the Dingle Harbour. You can visit him via a boat tour and many boat operators will refund your money if you don't get to see the dolphin. Even if you miss the dolphin, there are great views during the ride so it is worth the trip. The Dingle Peninsula can be divided into four regions. In the north it has low rolling hills with many sheep and beaches. This area also has the highest point along the peninsula, which is known as Connor's Pass. In the west, which is the most popular destination on the peninsula, you find the most dramatic cliffs, curvy roads, and a handful of historic sights. Dingle Town is the main town on the peninsula and it is situated by a natural harbour. It's a quaint town with most of its buildings constructed in the 1800's. There's a thriving art scene here and it's a great place to pick up some homemade handicrafts. Finally, in the south you will find beautiful green landscapes and rolling hills. There are some great beaches and views as well. If you're looking for some interesting activities, horseback riding and golf are some popular past times on the peninsula. Also consider exploring the peninsula on a bicycle. It makes for a beautiful ride and you'll get a more up close and personal experience in the area. There are restaurants throughout the peninsula and one of the best is Dingle Pub on Main Street in Dingle Town. It's a good value and a friendly place to pass some time. Also check out the Doghouse if you're looking for a quick and cheap bite to eat. If you want to try some good seafood or steaks then head to Spillane's Bar & Restaurant by the beach. It's a great place to grab dinner. Several restaurants around town play traditional Irish music. This is particularly true during the summer tourism season. It is really recommended that you travel to Dingle with your own car or a rental vehicle. The views along the drive are excellent and this will allow you the best freedom to see the entire area. Parking in town is also easy and usually free. Finding a parking space should not be difficult. You can reach the area by public transportation if you must, but once in town you're very limited in when and where you can go places. If you choose to take public transit then Bus Eireann has a route that travels to Tralee and other cities on Ireland's West Coast. You can buy a ticket for the entire trip when you catch a bus in Dublin, Cork or several other major cities. Instead of driving, another fun way to explore the area is by bicycle. You can take the Slea Head Road and enjoy a 30 to 50 kilometer trip, depending on the route you choose. This offers some of the area's best views. You can rent a bike in town for a reasonable price.